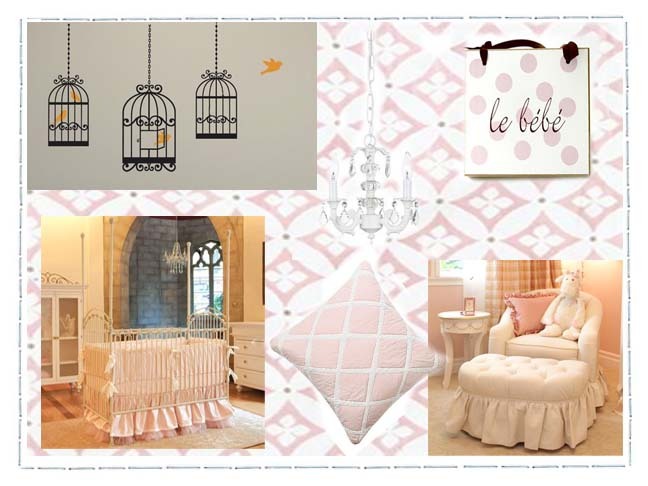 Create a beautiful and timeless French nursery for your little girl with these French-inspired design ideas. Use the soft colors, gently textures and perfect details to bring the French countryside to your home. The Bratt Decor Venetian Crib in Antique White ($878) is an elegant, versatile and classic beauty. This crib is top quality and has a beautiful posh look. 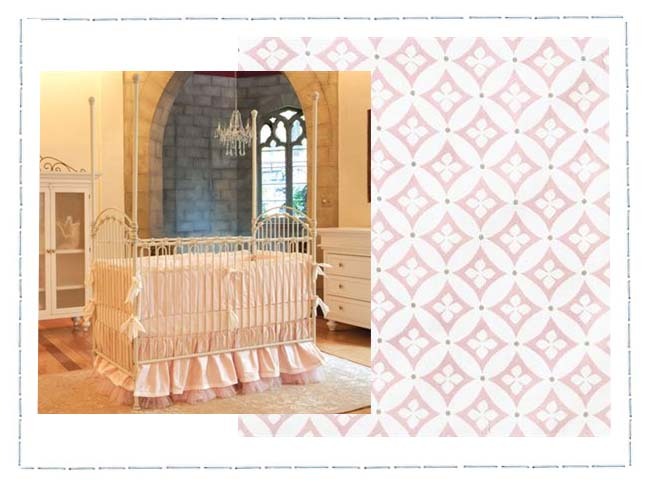 The Serena and Lily Pink Florentine Crib Sheet ($36) is a simple and soft design that compliments many colors and patterns in a French nursery. 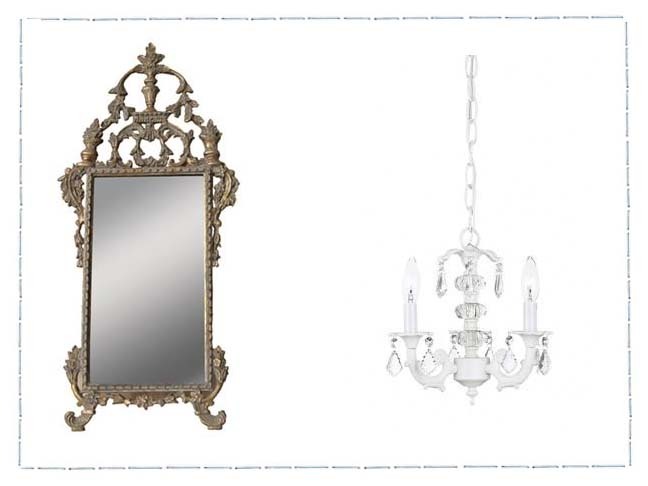 Click through for more beautiful nursery items. 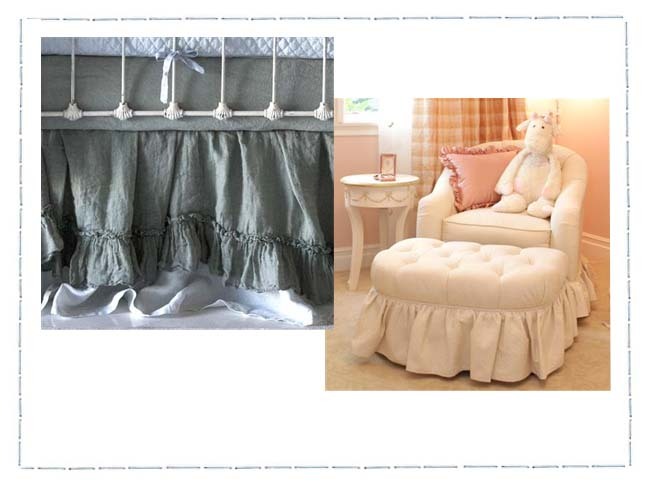 The Bella Notte Linen Crib Dust Ruffle ($271) is part of the world’s first easy care luxury linen line. Pure couture and style will be showcased in your little girl’s eye-catching nursery with this luxurious statement piece. The Dupont Glider and Ottoman ($1,179) is a down-filled luxurious and popular glider made for celebrities and posh parents. This amazing Pom Pom at Home Bedding Neck Roll Pillow ($46) is a beautiful accent not only for the glider but it also provides lumbar support for a parent. The fabrics compliment the dust ruffle perfectly and the soft color draws attention to it naturally. 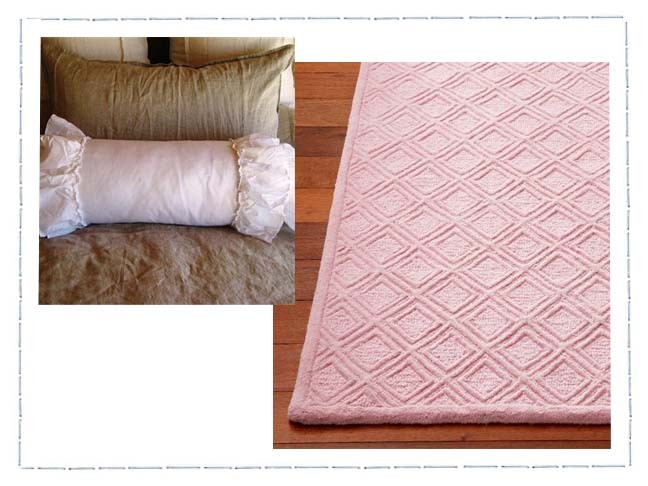 The Pottery Barn kids Sommerville Rug ($149-699) is a beautiful and simple diamond pattern wool rug that coordinated perfectly with the French theme. This Gilded Louis Mirror ($189) is affordable for what is it — a beautifully detailed, high-end accent for your French-inspired nursery. The White 3-arm stacked glass ball Chandelier ($155) is a dainty and beautiful option for soft lighting in your sweet baby’s nursery. 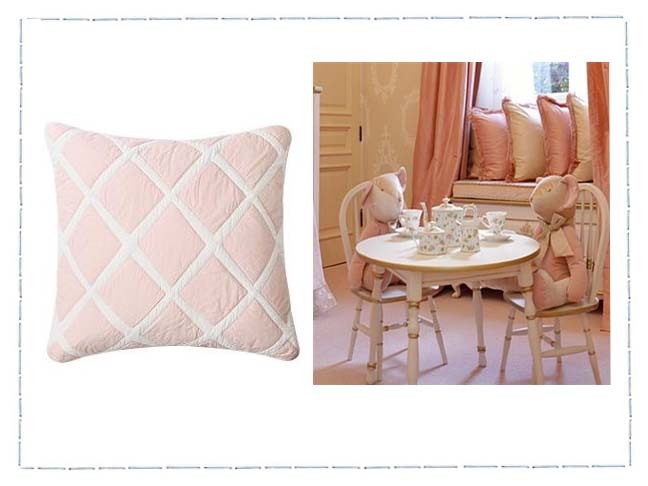 Think outside the box and use the Serena and Lily Pink Diamond Quilt Euro Sham ($68) as an option for floor seating while playing dress up and dollhouses with your sweet little girl… when she grows up. The Petit Ange Kid’s Table and Chairs ($760) proudly shows all the European-inspired finishes and details. This heirloom quality set will be in your family for many years to come. 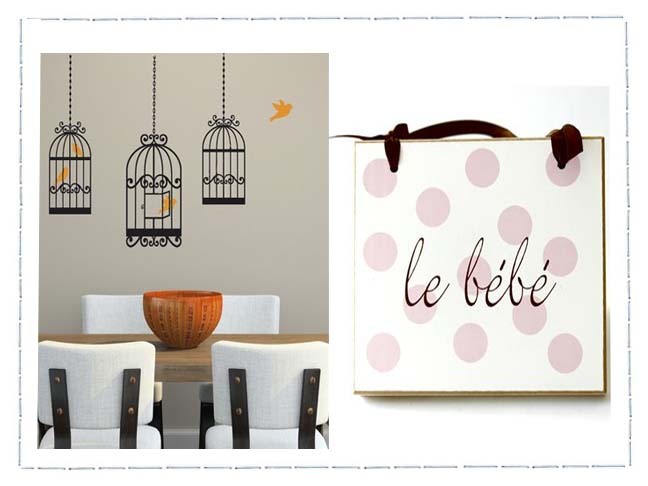 Bring some modern design to the room with these adorable and simple Birdcage vinyl wall decals ($45). This Le BeBe Hanging Sign ($26) is a perfect and simple decoration for the wall, bookshelf or door to your baby’s nursery.